Preheat oven to 450°F. In a medium pot, melt butter over medium heat. Once melted, whisk in flour and cook for a minute or two until it turns a light tan color. Slowly whisk in broth and bring gravy to a simmer. Turn heat down to low and let thicken for a minute. 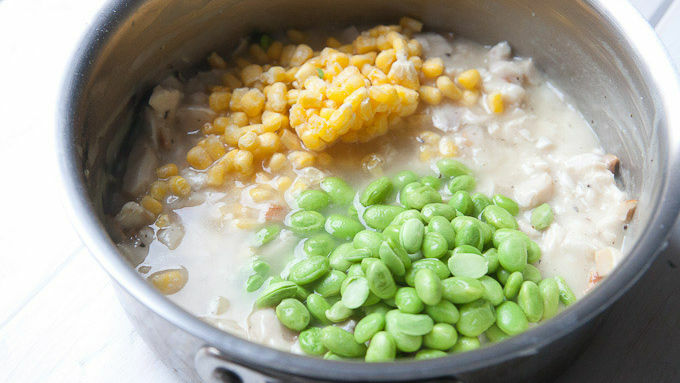 Then stir in turkey, corn and peas. Season the mixture with salt and pepper. Divide turkey gravy between individual ramekins or ladle into one large 1-1/2 or 2-quart baking dish. Top the turkey mixture with a thin sheet of mashed potatoes and sprinkle generously with leftover stuffing. Drizzle the top with melted butter. Bake at 450°F for 15 minutes to warm through. Then broil on high for a minute to brown stuffing on top. 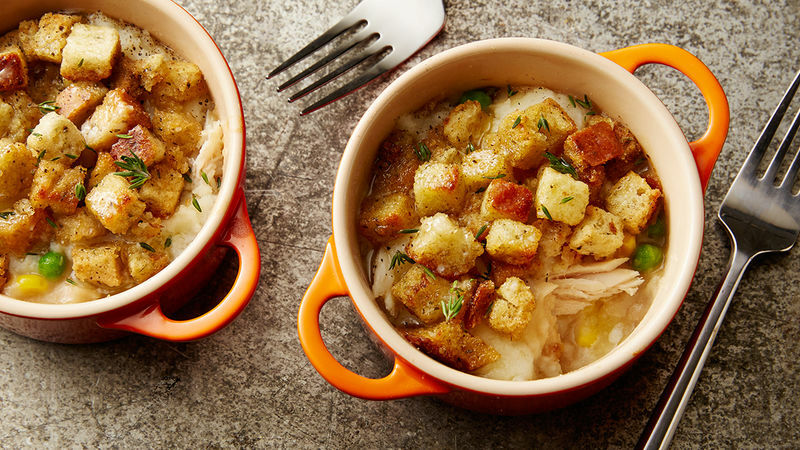 Make this recipe with leftover turkey or rotisserie chicken. It's scrumptious. Of course, nobody wants to cook much after a huge Thanksgiving feast. Turkey sandwiches are just fine for dealing with the leftovers. But maybe, just maybe, we can do better with very little work. After all, there are so many great foods in the fridge after a Thanksgiving dinner! These little pot pies are one of my favorite things to make. They are completely flexible and let you customize with what you have in your fridge. 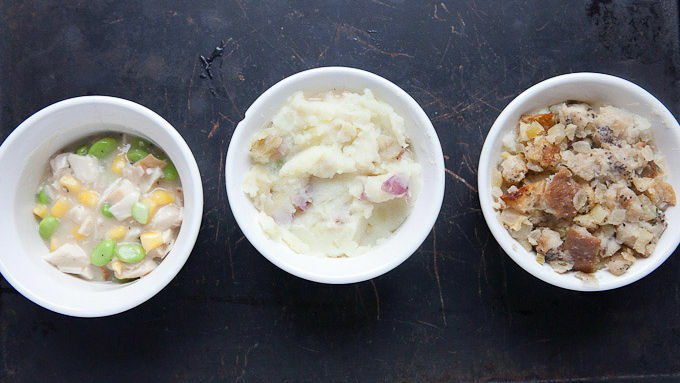 The three things that I think are most common for leftovers are turkey, mashed potatoes, and stuffing. We can use these to make a shepherd's pie of sorts. The key to any good pot pie is to make a great gravy. If you happen to have a good amount of leftover gravy, then you can just warm that to use. But I’ve never seen much leftover gravy, so you can make a super-quick fresh batch of gravy to use on the spot. Once you have your gravy ready, you can stir in some leftover turkey. I like to add some color to it, so I stir in some corn and peas (or edamame) also. Optional, but a little veg never hurts. Assembling these couldn’t be easier. 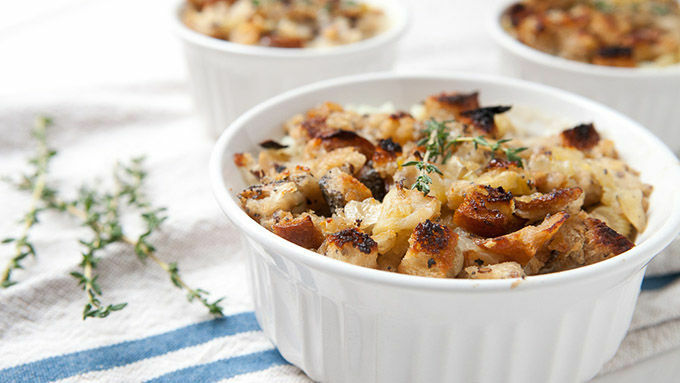 You can use either individual ramekins or one large baking dish. Layer in the gravy, then add a thin layer of mashed potatoes and top each one with leftover stuffing! Then chow down! If you like thinking about fun ways to use leftovers, be sure to checkout my cookbook, Love Your Leftovers. It has tons of great meal planning tips and recipes!